Times have been tough for many Americans in recent years. The ebbs and flows of the economy have affected people in vastly different ways, but one key point remains the same: good personal finances start in the home. However, many don’t keep track of where their money is going. 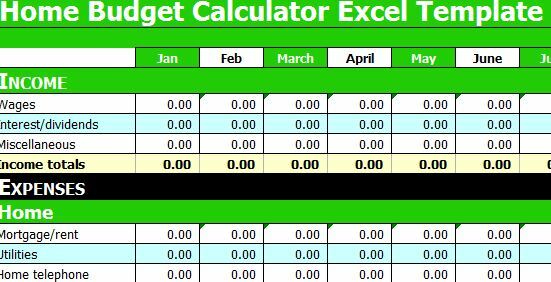 A home budget calculator Excel template can easily solve those problems. And since we’re talking about money, it’s important to note that this calculator is also completely complimentary. Within each category is a collection of subcategories. For example, under home, the subcategories include mortgage/rent, utilities, phone, home repairs, home improvement, home security and garden supplies. You will input all the money you spend on these respective bills and the total will be calculated at the bottom of the column for the month. This process will be repeated with all the other main categories and their corresponding subcategories. Once every subcategory has been filled out, the amount for all expenses will be calculated at the bottom of the template. Whether or not you have a cash surplus or you are short on funds will also be revealed. These figures will be displayed every month and your cumulative total will be displayed at the end of a calendar year. 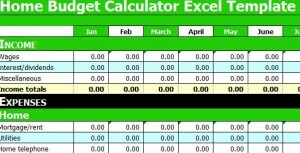 Perhaps the best aspect of the home budget calculator is that it is completely customizable. If there are expenses you see on the spreadsheet template that you will never have, simply remove them. Conversely, if you have expenses you do not see on the template, feel free to add as many as you need.